You've earlier completed NYSC mobilization registration. You’ve to wait until the announced date by the body in order to print your call-up letter. That’s the procedure. Is it the time to print? Then, you must follow the steps below in order to have your posting letter handy. Here is NYSC dashboard. 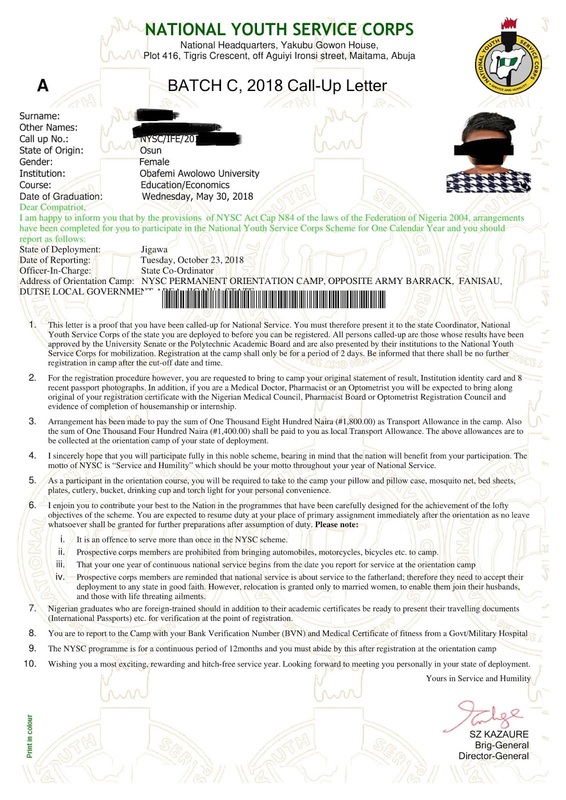 Click on "Print Call Up Letter"
Before we proceed, you have to note that Call-Up letter is different from NYSC Green Card. While the latter is just the acknowledgment of your completed registration, the former is the official letter that gives/shows the state you're posted to. Call-up letter will detail all necessary information needed at camp and state posted to. Below are the steps to print your call-up letter. You will need to have a PDF reader (adobe reader) installed on your device (phone or computer) before you can download and print your letter. Call-up letter (like the green card) must be printed in colour to show clarity and originality of your letter.